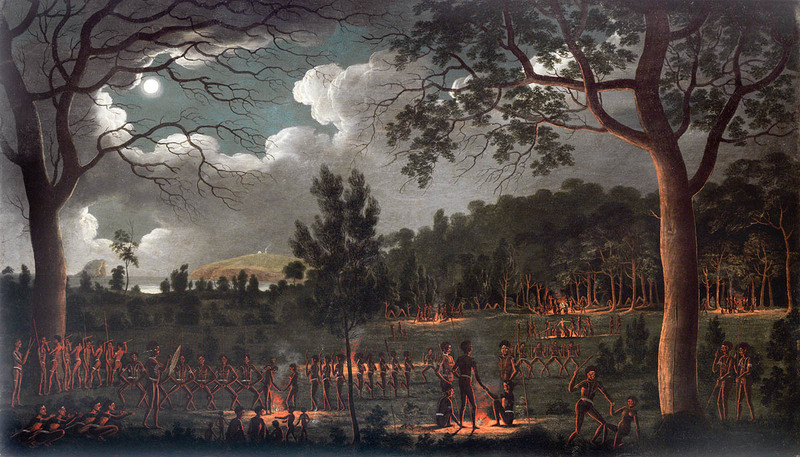 The Awabakal people of Lake Macquarie and Newcastle used coal for fire to prepare food and references to coal were made in their myths and legends. The territory occupied by the Awabakal people encompassed Newcastle, Lake Macquarie, Central Coast to Wyong, the coalfields area and the Watagan Mountains to Wollombi, an estimated area of 1800km2 (Maynard 13). In the Awabakal language the word for coal was "nikkin" and Lake Macquarie was called Nik-kin-ba meaning "the place of coal" (Gunson 64). Coal was highly visible in the Newcastle landscape at Reid's Mistake at the entrance to Lake Macquarie, and at Nobby's Head. In 1830 Sir Edward Parry had commented that the seam of common coal at Reid's Mistake was 8 feet thick and of good quality, "close to the beach, indeed upon it" and that the "coal crops out in a broad seam upon the rocks which are dug at low water" (Gunson 112-113). The Rev. Lancelot Threlkeld (1788-1859) stated that open burning coal was visible in Lake Macquarie "upwards of twenty miles from East to West and in some places eight miles from North to South". Furthermore, three or four miles from Reid's Mistake underneath a "point called by the Aborigines Mu-nu-kan...there crops out a seam of canal coal, beneath which is a seam of superior common coal, both jet into the sea in three or four fathoms of water". He also noted that Lake Macquarie had "a projecting seam of excellent coal of the caking description" which burnt "with a bright flame, throwing out great heat" (Gunson 64). Evidence of coal use has been found in beach and dune middens in Lake Macquarie at Swansea Heads and Ham's Beach, and on the Central Coast at Mooney Beach. It shows that coal was used by the Aboriginal people for cooking fish, shellfish and abalone. Dating of the occupation level of a beach midden at Swansea found that coal was used well over one thousand years ago (Stockton 23). The women of the Awabakal tribe fished with hand lines from canoes with a small fire burning on a clay pad in the canoe. Percy Haslam in his lecture on the Awabakal people in 1981 described the canoes and their fires: "Bark canoes made from a single flawless sheet of stringy bark, were used to criss-cross Port Stephens, Lake Macquarie and other waterways in the region. There was always a characteristic clay mound, often in the stern, where a small fire was kept burning while the canoes were in use." Threlkeld noted that the fires were used not only to warm hands and feet, but principally used to roast bait of either cockles, fish or flesh from the star. The women also cooked fresh fish whenever they were hungry (Ray n.pag.). Attenbrow, Val. Sydney's Aboriginal Past. Sydney: University of NSW Press, 2010. Print. Gunson, Niel. Ed. Australian Reminiscences and Papers of L. E. Threlkeld, Vol. 1. Australian Institute of Aboriginal Studies. 1974: 64-65. Print. Haslam, Percy. "The Original Inhabitants. Lecture 29/4/1981." Typewritten material and news clippings relating to Awabakal Aboriginal myths and legends, language, culture, compiled by Percy Haslam 1964-1981. University of Newcastle Archives. Print. Ray, Greg. "Hunter River Supplement." Newcastle Herald. 11 May 1993:4 Print. Stockton, E.D., 1977, "Middens of the Central Coast, New South Wales." Australian Archaeology 7. (Oct., 1977): 20-31. Print.